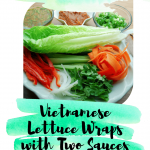 I love making Vietnamese lettuce wraps for large groups. Each person gets to build their wrap the way they want it, and it’s easy to prepare ahead of time. These lettuce wraps are endlessly customizable. Try experimenting with your protein (shrimp and mahimahi are both really good), or you could add a wider selection of herbs and vegetables. The two sauces I have listed here are my two favorites. I love nuoc cham, its unique flavor makes cold refreshing vegetables taste amazing. 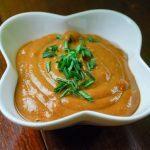 The peanut sauce is a crowd-pleaser, I always get requests for the recipe when I make it. Add all the ingredients to a bowl, and mix until homogenous. Pre-heat the oven to 350°F(175°C). Salt the pork. Heat an oven safe pan over high heat. Once the pan is hot, place the pork in the pan and immediately turn temperature down to medium. Sear on the first side for 3 minutes before flipping. Sear the pork on the second side for 3 minutes, then transfer the pan to the oven. Leave the pork in the oven until it has reached an internal temperature of 140°F (60°C) this usually takes about 7-10 minutes. Note: make the pork at the end if you would like to serve it hot. Otherwise transfer the pork to a piece of foil, and refrigerate until cold. Prepare the rice noodles per the boxes instructions. Add cold water once done, and refrigerate until ready to serve. Slice the carrot, bell pepper, onion, and cucumber into thin slices (I often use my peeler on the cucumber and carrot). Chop off the bottom of the cilantro stems. Slice the green onion. Thoroughly wash the head of lettuce. Break each leaf off the core, leave the leaves large so that you can fill them with the toppings. To serve, let each person add their choice of fillings and sauce to a lettuce leaf. I suggest making enough for each person to have 4 lettuce wraps if this is a main dish, or 2 lettuce wraps as a side. If you have any left overs, toss them together with the sauces, and enjoy this dish as a mixed salad.